This bed is up hill from two small gardens and 50 fruit trees and will also act as a Permaculture Swale when I get it completed. Fortunate or unfortunate I have more rotten wood. 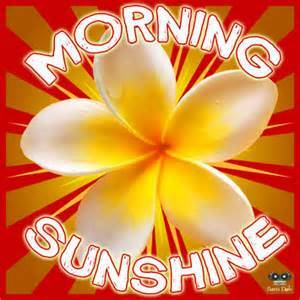 Very nice...keep us posted on how it works out. Got most of the wood covered. I'm going to extend the bed at both ends later on. I seeded buckwheat as a cover crop for a fall planting of vegtables. Just need a little rain now. Does anybody else have a Hugelkultur bed to show? Way to go... the pic's are great. Keep us up to date. Today i started stacked rock along the edge like Jack talked about in eposode 693. I'm going to use limestone rip rap rock, because it's pretty much the cheapest way to go for me. Not much rock here where I'm at. I like this idea, becuase the rock will help retain and draw moister, help hold heat, and give it a permentate 'frame' that will out last me. We did get some rain, so when the buckwheat starts growing I'll post another picture. Hope to see other Hugelkultur Bed soon. 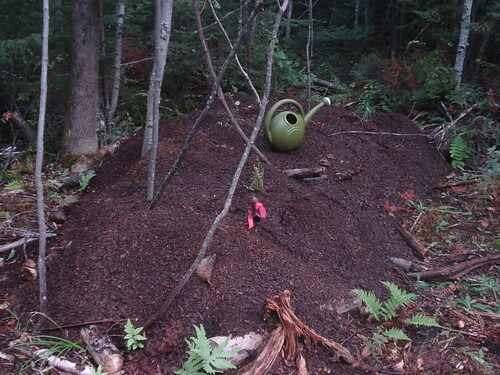 Found another thread here of a really nice Hugelkultur Bed. 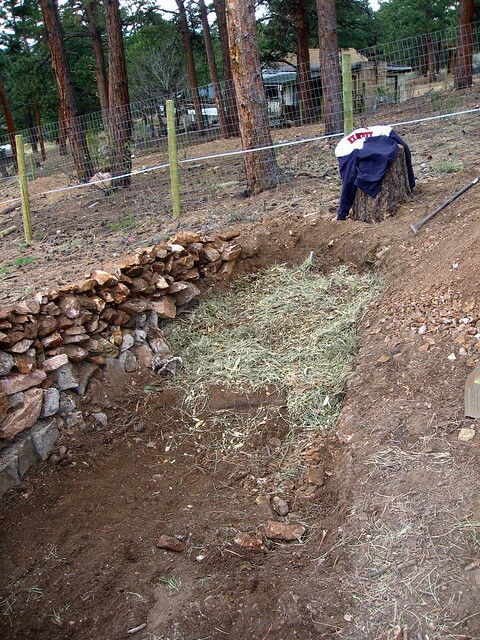 This picture is of a new rock wall I put in with rock I got from just digging down about 12" (to unyielding bedrock). You'll notice how in the foreground there's bare soil that's about 12" below the grade going up to the right. 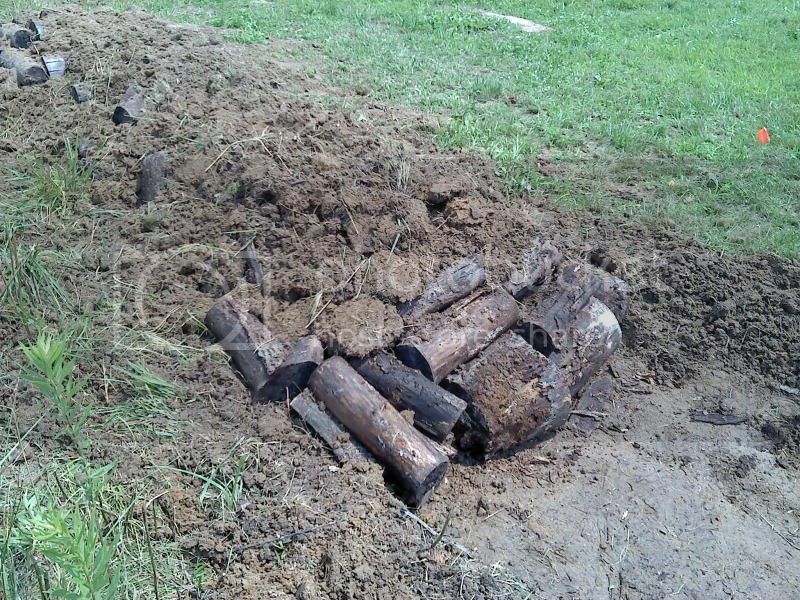 After removing the soil and separating out the rock, I put in about 12-18" of old logs, mostly Ash and Elm on one end, mostly pine on the other, based on what I have available. The bed is now about 35-40' long and varies from 5-15' wide as it followed the contour of the hillside. 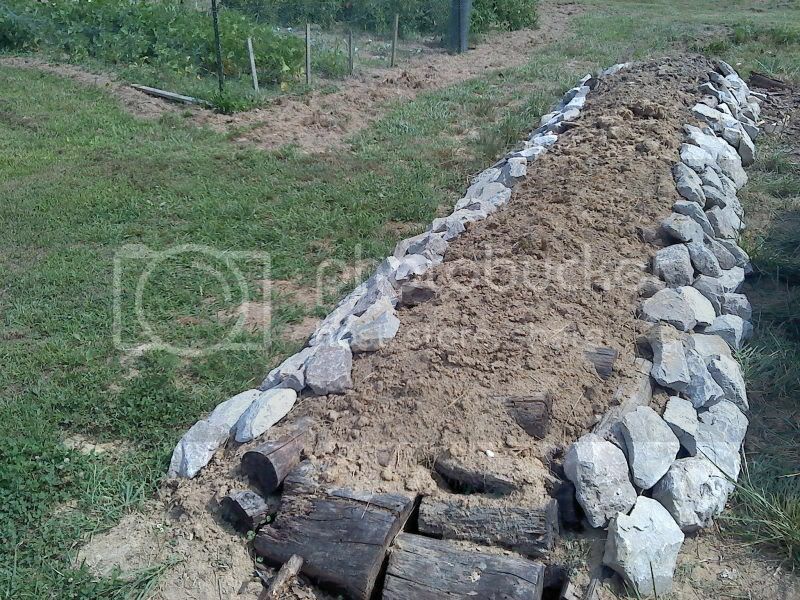 I put about 6" of woodchips and old hay on top of the logs (shown), then added 6" of horse manure, then 12" of top soil to the point where the soil was level with the top of the rock wall. To the right in the picture is a swale that's about 70' long that I had put in with a bobcat. My soil profile is 0-6" 60% sandy loam with 40% 2-6" rock, 7-13" 30-40% sandy loam with 60-70% 2-12" rock. Decomposing granite with areas of granite coming to the surface. 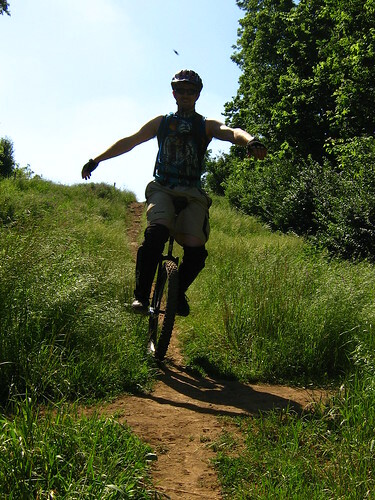 Occassionally soils to a depth of 14-18", but mostly shallow rocky soils that drain well, but lack organic materials. The area is covered in ponderosa forest with 15-20% openings. Soil is slightly acidic, about pH 6-6.5, worse in areas of denser trees, approaching pH 5.5. I'll try to get up more pics this week, as I have about 12 weeks worth of pictures in my camera that need uploading at the moment. The spot you're looking at right now has about a half-dozen trees, 40-50 strawberry plants, another 4-5 shrubs, and a variety of garden herbs growing under a 2-3" bed of pine mulch. It's been a lot of work to get set up and right now I'm drip irrigating 2-3x a week while everything gets established, but I'd suspect by this time next year, I'll be down to 1-2x a week (in an environment that gets about 17" of moisture, mostly in the form of snow, every year). I'm also growing some veggies this year in this bed because I didn't have other bed space available, but I suspect by next year I'll have new beds in and have the entire bed dedicated to being a perennial forest garden. Hey Muddy, I just started a thread on what I did to develop my beds http://thesurvivalpodcast.com/forum/index.php?topic=28530.0. As always, lots of trial and error. Was able to finish putting the riprap down on the side a couple days ago. The buckwheat is starting to come up even though it's only rain once. wow - I like the rocks on the edge! makes it look really pretty! Yeah my wife likes it now. She wasn't sure about me building anymore, but now I have the go ahead for more. I think I'm might see how well this one does before I build another. I'm going to extend it on both ends a little so I did put rock on the ends. Nice job, Dave. Thanks for the link. Looks good. 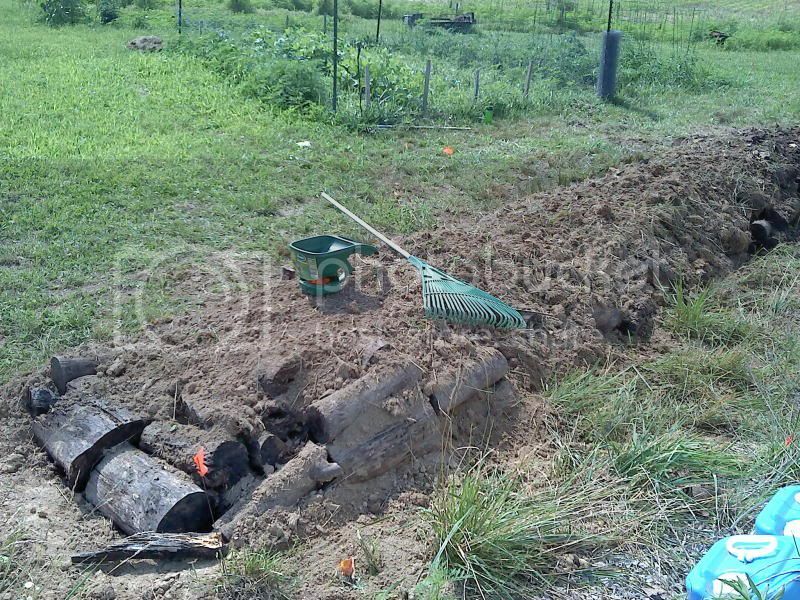 I like how you used a nitrogen rich mulch, lawnmower clippings, over your logs to help provide a nitrogen source. It made a really big difference. I cut the grass down and immediately raked it up and put it in the bed. Within a few weeks the grass clippings had started turning that nice black slimy composty feel and look. I think it made a huge difference with this bed. The mandala shape is fantastic, too. I love our "hugel bed". I'm new to permaculture and didn't know what a mandala garden was so I looked it up, and I will be building atleast large one. Most of our yard is sloped and "linear gardens" don't work in most places and I'm over 4x square beds. MuddyFork, it definitely sounds like you're ready for mandala shaped beds. Congrats on that riprap, by the way. I wish I had access to such quantities of rock. Well I don't have any pic's, but I can attest to the Hugelkultur bed with grass clippings! I randomly decided to make one in my parents backyard, much to my father horror when he discovered I was building a "Termite house." But, this year the garden is doing almost absolutely nothing and the bed I build it taking off with volunteer tomato's, some green beans, and some sunflowers! 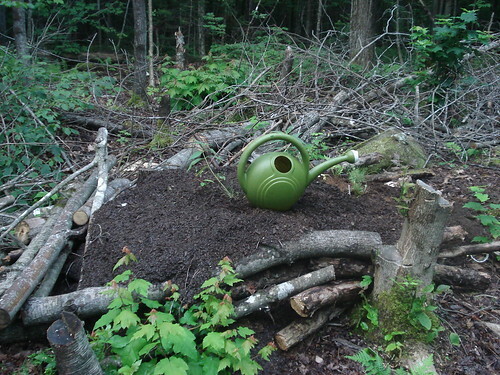 I'm thinking this is a great way to go for gardening, as long as the termite thing isn't a serious threat to the house. I have moved this post to the Permaculture board and made it a sticky. Keep the pictures coming folks. Very cool indeed. I have seen schematics of something similar in my Permacluture book. 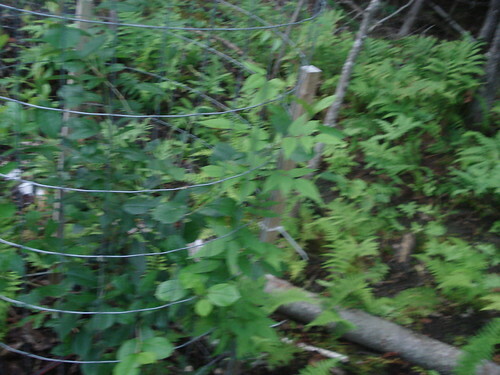 I was thinking of building one also using saplings from around the property. Keep us up to date on how it works out for you. 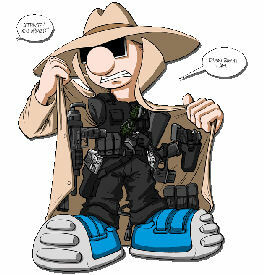 After listening to Alex Jones recently, I was almost scared to post my huggel kultur pics, but I guess I am either brave, foolish, or too tempted to show off .. I am going to grow various perenials and greens mixed into these beds, but also ground nuts or other invasive things. All these beds have 18 inches to 2 feet of logs under them, mainly poplar and some birch. 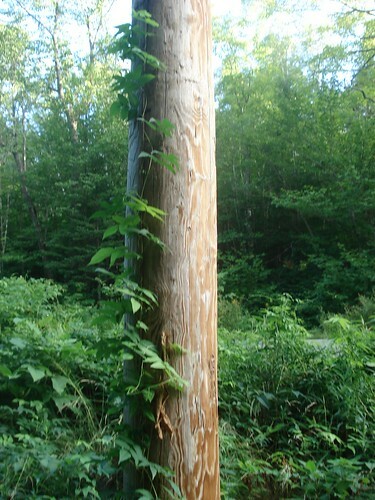 The beauty seems to be I can cut some trees and if I don't use them for firewood in time, they can become huggle logs .. Bed 1. 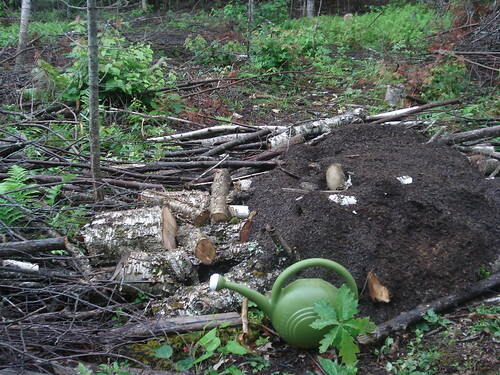 I burried the base of small trees and all in wooden logs covered with dirt. I figure ground nuts can climb these, or I will cut these trees when they start to grow too big. This bed is partially shaded, but I can expose it to more sun next year but cutting some trees ..
bed 2, small mound. I will probably put logs around it to prevent it from flattening out ..
bed 3, intended for rasberries/groundnut combo I think. bed 3 from other side with more logs added. more than other trees, at least on my land. 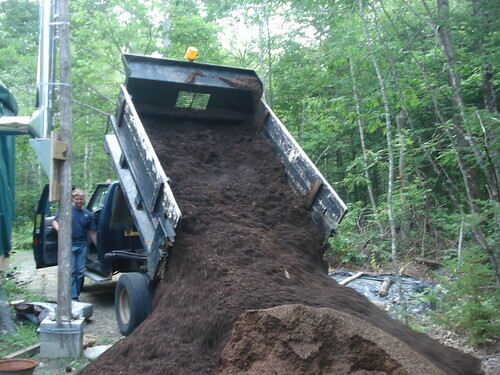 look non conformist horders/terrorists at work, using dirt compost ! People trying to grow food outside the system ! bed 4, different clearing, intended for Jerusalem Artichoke/ground nut combo. 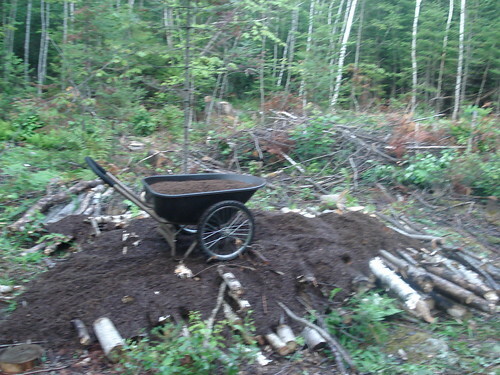 This pile is going to be smaller as I had to cart the dirt some 600 or 700 feet through the woods. I want to isolate JA as they may be too invasive ..
these days, but I have developed a similar fondness for the ground nut. Tag for later viewing pleasure. 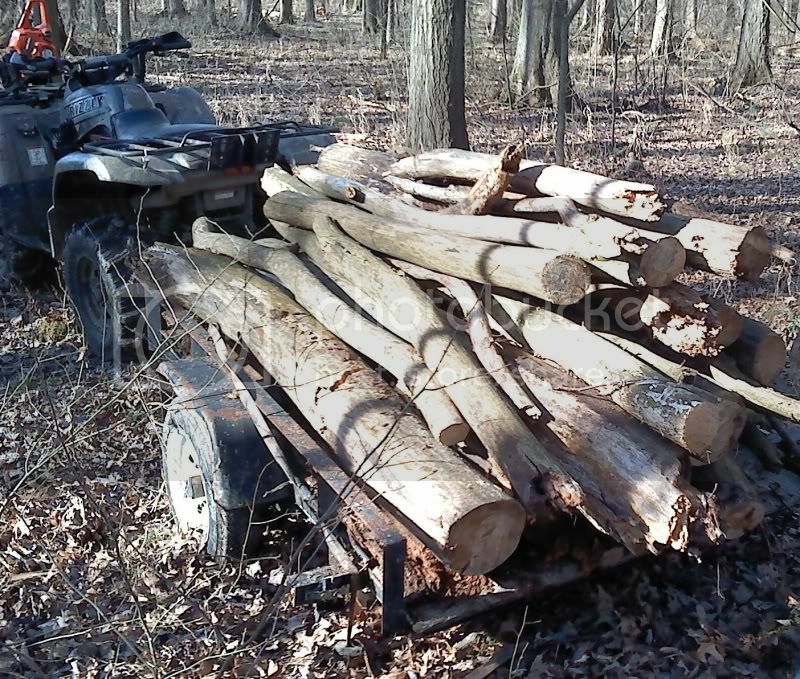 This is a pic of a trailer load of logs for my beds and the tools I use to get them out of the woods. My 11" Sandvik Log Tongs I use are almost worth their weight in gold. I can 'easily' drag, load, and unload a trailer load of 6' logs with them. Thought I'd share this affordable tool with everybody. 1) I live in an urban area with a 50'X150' lot. Situated east-west on the long side. Yeah, it is damn small. 3) There was an overgrown bush/tree in the far north-west corner that I cut down and just finished digging out the damn stump. The trunk is probably 6" in diameter. 1) Dig a 4'X9' trench 3 feet deep. 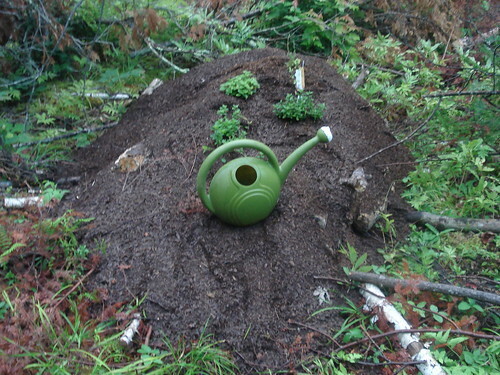 3) Cover with compost and refill with the dirt. 4) Construct a 6" raised bed above grade and fill with compost and the remaining dirt. 5) Come spring, I will be ready to plant beans to get the nitrogen back into the soil. Lastly, I am going to plant an orange or peach tree in the northwest corner where the bush was. Any comments on my plan? Will this function as intended? Any suggestions on the composition of the compost, keeping in mind I will be getting from the local Home Depot or nursery. I think Jack did a show on what types and mix of compost to put in new beds, but I cannot recall. Please comment if I am being stupid in this plan. It is not too late to just construct a standard raised bed and use the "Square Foot Gardening" method. What you are planning sounds pretty good to me. My suburban property seems pretty close in size to yours and I've done four raised beds using the hugelkulture principles. My main beds are double stacked cinder block (from Lowes/HD) which give good height, I initially dug out about a foot down and removed the soil to give me some extra room. 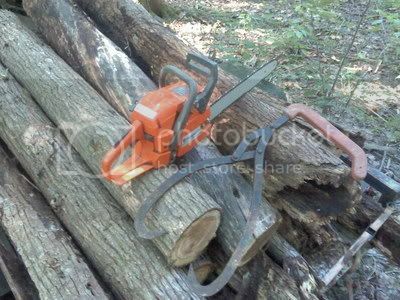 I collected logs (4'-5' long by 6"- 8") from trees being cut down by the city. 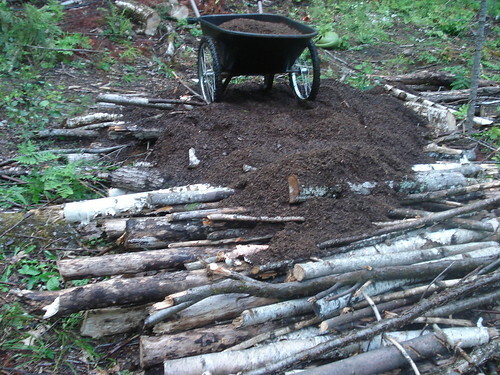 I just threw the logs into the bottom and filled with a mix of lasagna gardening style material. Seems to work good but probably won't see the true benefits for another couple of years as the logs breakdown. 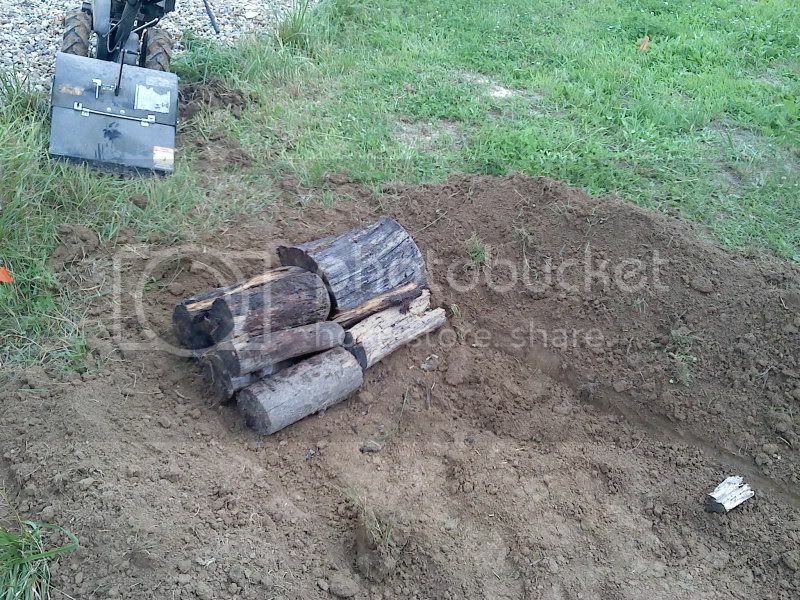 I've been collecting logs from my city worker friends for years and also use them by burying them almost all the way in the ground (leave a little showing) around all my other yard plants/beds. 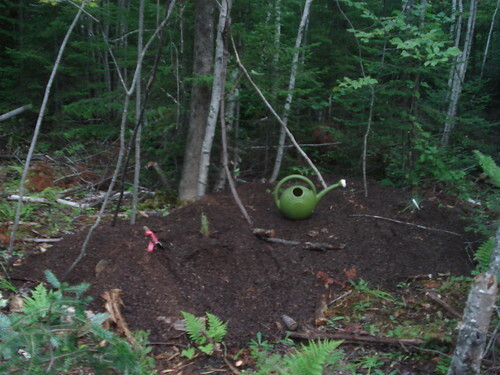 This isn't truly hugelculturing but I'm thinking it is a good way to help keep the soil rich. I am chronicling all the stuff I am doing with Hugelkultur, here are parts one, two and three so far. Many more additions to follow. We went out to zone 5 and got some more logs for the beds we're going to be building this year. It's a great time of the year to get decaying wood; you can see the logs from a ways off, no bugs, no ivy, and it's not HOT! MuddyFork, Ain't it great. Working on this stuff is so much easier right now. Jack, thanks for the work you do getting all this great info out. Here is my experiment with Hugelkultur. So far so good. The hugelkultur swale is really coming around. I look forward to using it as a foundation to starting my food forest.